skin issues. All of it in a unique space made of salty caves and runned by a team of professionals that will take care of your wellbeing. located right in the city center, a few minutes from Puerta del Sol Square is Al Andalus Hammam, a well known spa centre in town that offers a wide range of exclusive treatments, making this choice perfect for a relaxing afternoon after a long day strolling the streets of Madrid. flavor, better acompanied by the selection of sweet and salty snacks also offered in its menu. For art lovers, this terrace is the perfect option to enjoy a cocktail or a snack in the city centre, after a visit to the museum. Address: Paseo del Prado, 8.
music area in the ground floor and a fantastic restaurant and terrace in the rooftop. Address: De la Luna Street, 2. Everyday from 7:00 am to 1:30 am. place, offering a quality service and a fusion cuisine. There is also a brunch every Sunday, very popular among madrideans. Address: Plaza de la Independencia, 4 -Puerta de Alcalá- Opens every day from 12:00 pm to 2:00 am. Royal Palace, ideal to recover strength after a day visiting the city. from 12:00 pm to 1:30 am. 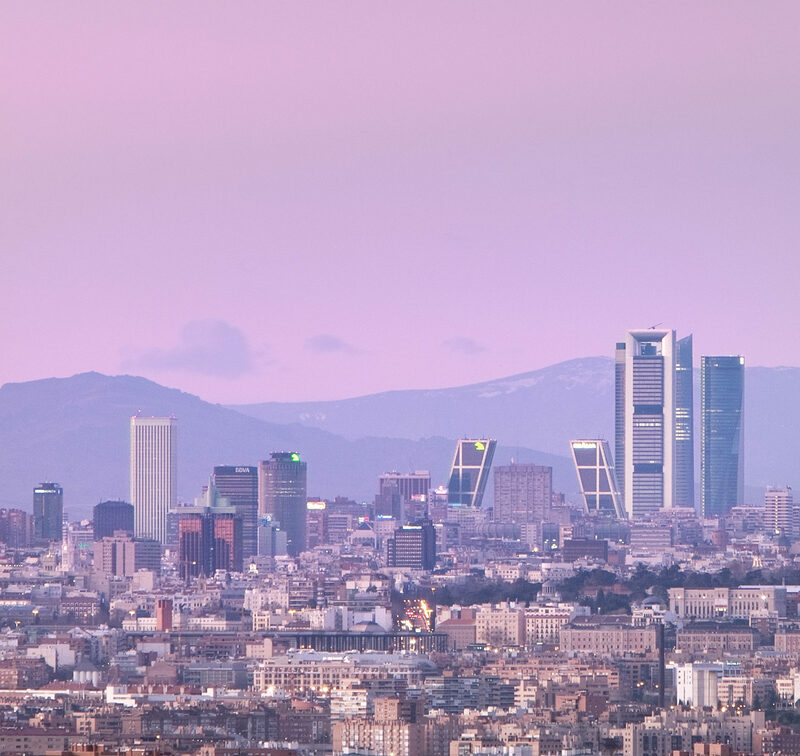 Madrid is beautiful from every angle, but our favorite is from the rooftops. Terraza Cibeles is one of the best places to observe the city, enjoying a delicious drink while seeing the sunset. In October, the Thyssen Museum organizes the exhibition of the year with a retrospective of the most important German painter of XXth century, Max Beckmann and Exile Figures –Figuras del exilio-. Also, the Prado Museum is celebrating this year its Bicentenary and organizes an special exhibition starting in November, a date that art lovers can’t miss! Enjoy a day trough the route that aspires to be declared Humanity Heritage in the category of Cultural Landscape, a route that includes the Paseo del Prado Boulevard from Cibeles Square and Atocha Square, the Retiro Park and the Jeronimos district -behind the Prado Museum-. In November the annual appointment with Jazz takes place with Madrid’s International Jazz Festival, a large sellection of acts on the global jazz scene will once again be showcased at, better known as #JAZZMADRID18 . Seasoned artists as well as talented newcomers make up the line-up for the festival’s programme, which will be hosted by various venues around the city. An event that also includes parallel activities such as exhibitions and films relating to the genre, as well as discussions and lectures by experts and critics. Address: Conde Duque Street, 11. Our proposal for the adventurous is taking a bike tour around the city center. A different way of getting to know the city on an eco and healthy way. This train station was reconverted into a Museum in 2008 after an underground restoration that took place in 1966 to widen the platforms from 60 to 90 mts. It belonged to line 1, the first metro line and it was inaugurated in 1919. It used to connect the neighbourhoods of Sol and Cuatro Caminos, being nowadays still crossed when going from Bilbao to Iglesia (or viceversa), but trains don’t stop there anymore. Address: Chamberí Street, s/n -Chamberí-. A visit to the Rastro Flee Market is a very common activity on Sundays among madrideans. This market offers a suprising walk where you can find madridean quintessence: sounds, scents and colours. Enjoy a morning at the Rastro Flee Market buying, wandering around, taking pictures, drinks or listening to music. There are plenty of things to do around its many streets, squares, shops and galleries. Address: Ribera de Curtidores Street, s/n -La Latina-.